So here is my tutorial for the Merlin (Asus based) Firmware. This tutorial is made with a Asus RT-87U Router. I decided to buy this one because of a few reasons. Good performance as you can see here and two separate DualCores for each Wifi (which are not as used as good in DD-WRT)! O/C function, alternative Firmware from Merlin, which is based on the original one and etc. Merlin is common for Asus, but there are a few developers, who port it to other routers as well. So here we are now. At the end you are able to choose which client should use which Gateway (WAN/VPN) for which URL, or all, or nothing Furthermore you are able to connect to all devices in your whole network, if you are connected to the Merlin Router. VPN gives me 45mbit down, parallel 6mbit up. You should be able to surf the net and connect to other devices in your subnet 192.168.1.0/24 or 192.168.178.0/24 That's important. Do not play around with other client tabs! I have spent a whole day, because of testing vpn on client 1, at least i use client 2, but the playing around on client 1 had blocked my WAN port, inspite of having this client disabled! In my case, select instance Client 2 (it means tun12 later on). 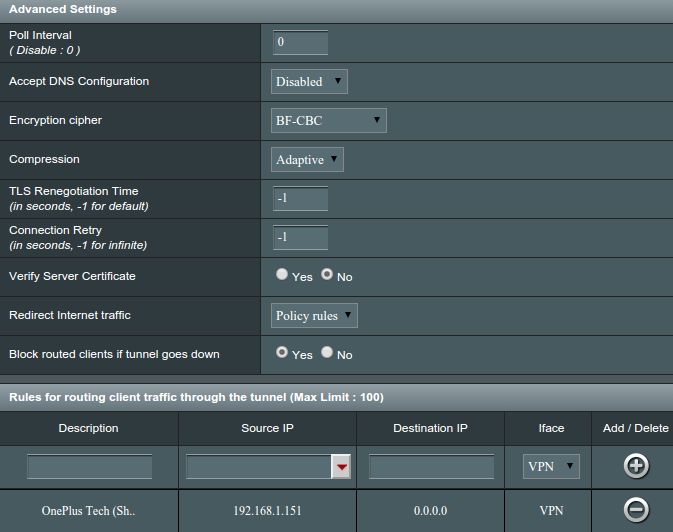 Now browse to your openvpn (YourUsername.ovpn) file and upload it. Select "Start with WAN". Protocol UDP or TCP, Fill in Username / Password. Choose Authorization Mode to TLS and click on "Content ..." next to TLS. - choose your Encryption cipher (you can find this inside your YourUsername.ovpn file, if unsure) but usually it is "AES-256-CBC"
- Redirect traffic to "Policy rules"
- Block routed clients as tunnel goes down (also known as killswitch) - "YES"
Put in your clients, which should use VPN and point them to Iface VPN and Destination 0.0.0.0 (0.0.0.0 means all destinations). 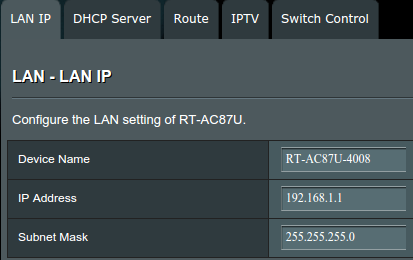 I use manual IPs via Mac Adresses (LAN/DHCP Server). If you connect to the Asus your device should be shown in this list and you can choose them. Clients which are not mentioned use WAN / ISP IP. 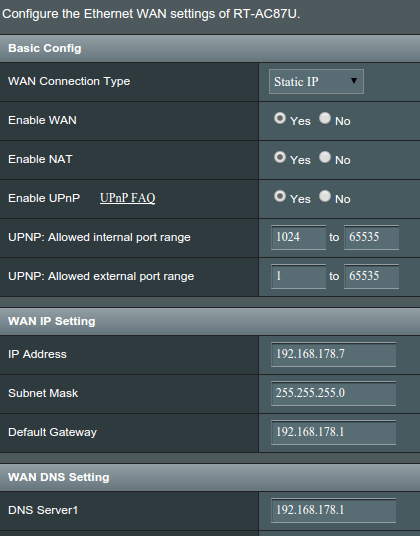 Destination IP could also be used with a single IP, or entire IP range. Click APPLY - your service state should be green, otherwise check in the system log in this section. Check on http://check.nvpn.net whether you are successfully connected to the VPN, as in my example my phone is (192.168.1.151), or if you are on WAN (in my case all other devices). With the tutorial above you are only able to connect ALL devices if your PC is in the ASUS subnet. How to get to the Asus subnet, if you are connected to the ISP Router (not to the Merlin one), means your PC is in subnet 192.168.178.x? "System Log - Port Forwarding" should show you now the preroutings via nat-start (if you have such) and the vserver routings which you have added in the last few lines! If you want your devices to be "connectable", then you have to put in some iptables rules in order to get this working. In my case my NAS (192.168.1.99) is behind my router and i want to connect to this via tunnel, or maybe it should be connectable for BT (TCP). Give the script the rights via "chmod 777 nat-start"
You should be connectable via VPN IP right now (if the device is in VPN, and the port is also open in your NVPN Firewall in user section). Do not forget to "chmod 777 services-start"
Save your settings and backup JFFS partition.